Once upon a time, there was nothing like socks. Knitting socks made my heart sing. Then, we fell out of sock love, but it was okay, because I was testing my knitting wings and taking on lace, cardigans and more. But earlier this summer, you packed up and moved away. There was no knitting joy in podunk. And Mojo is taking the blame for a sweater’s worth of Spud and Chloe Sweater coming home with me from Pins & Needles’ going out of business sale. 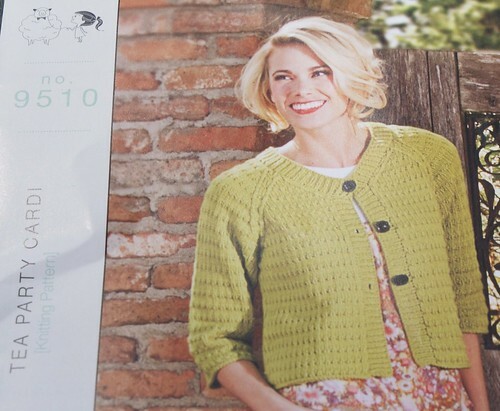 It’s going to grow up to become the Tea Party Cardi. 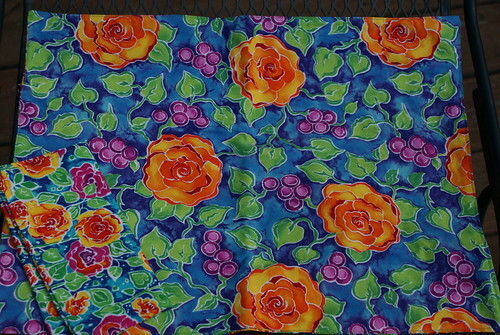 I bought that at Knitting Addiction last time we were at the beach. So Mojo, I just have one favor to ask… Please stick with me through these projects, and on into the stuff I want to finish for Christmas. Yesterday was Gretchen’s birthday (see their blog for the fur girl account thereof), but on Saturday, I got a special delivery. 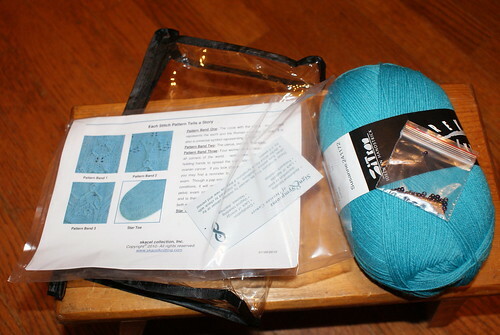 The lighthouse was but one of several items in the care package from Coffeeyarn. As you can see, there was a little confusion about whose lighthouse it is. I had some trouble getting photos. Sis was VERY taken with it at first. 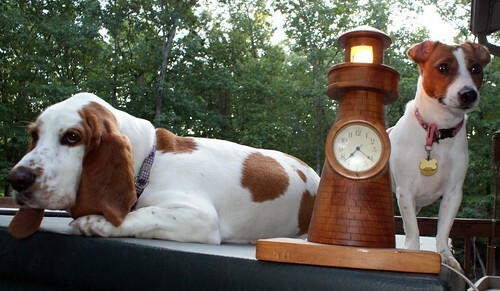 There’s a reason that long before Sis’s mother was even born, the Knight and I joked that we wanted a female basset next and we would name her Nosy Rosie. 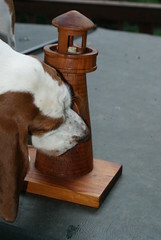 EVERYTHING is to be investigated by those big noses, and evidently, the lamp had far more smells in it than most things. I even left it wrapped in bubblewrap, out of reach, for a good 24 hours before I even tried to unwrap it and get photos, but as you can see, that only seemed to make it that much more interesting. Aren’t the placemats and napkins cheery!? I am itching to do a kitchen makeover, and these colors are very inspiring. 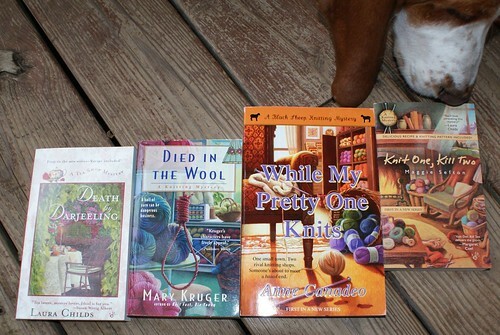 There were more goodies in the box too, but the other item I know will interest you was my own hank of wine-yarn. 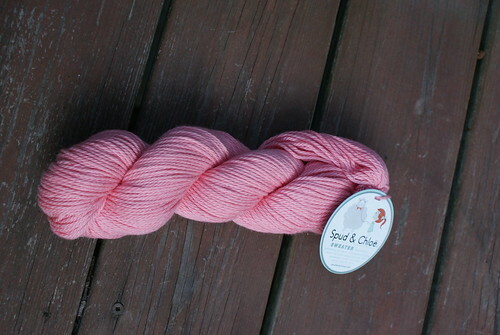 Despite having cast on for a new sweater, I’m itching to make a wrap with this lovely yarn. Coffeeyarn needs to change her screen name to Coffee&wineyarn, doesn’t she? Thanks so much, Barbara! The lamp is going to find a safe, treasured spot in our home, and I can’t wait to go Rav-stalking and pick a pattern or two for the wine-yarn. How was your weekend? I’ll tell you about mine tomorrow… It didn’t follow the plan so well, but it was nice just the same. 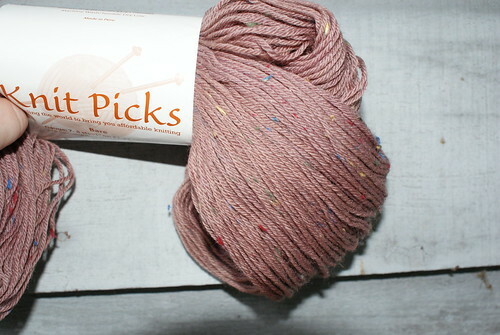 I had to have this yarn. I mean, what a name!! What’s ahead for your weekend? I’ve already mentioned my plans… Really, I just want an afternoon nap. I do know what I’m wearing tonight (gotta’ love a little black dress or three; one is always at the ready! ), and I have a gift for the shower. 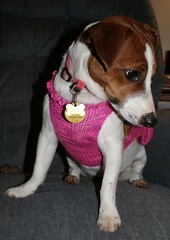 I do need to hit PetsMart or someplace and nab a cute PANK dress and whatever else jumps out at me. If you’re here for Dogs on Thursday, please visit the girls’ blog, because Sis did a really sweet tribute post. You might recall a couple of weeks ago, we had no internet at home for about five days, due to a lightning strike, our DSL modem, and the ethernet card in our desktop computer. I didn’t bother to tell you about the Knight getting his Blackberry replaced last week because suddenly, the volume control wouldn’t work, but now that seems a little relevant. You see, we both installed major software updates about ten days ago, and then yesterday evening, my phone stopped doing ANYTHING but sending texts, and those were only going to email addresses, not to phones. And I do realize our problems have nothing to do with each other, but if you haven’t read it here before, I don’t believe in coincidences. Now, for the rant. The Knight was ready and willing to upgrade my phone. He wanted the new Droid. None in stock. He called me back; how about a slightly smaller version of what I had? Fine. Office phone rang again. Nope. Don’t have that either. Doesn’t appear they have a SINGLE smart phone in stock, so they were able to do a master reset and my phone seems to be back to normal. Great! I don’t like change much, so if it ain’t broke (anymore) don’t replace it. HOWEVER. Sprint lost a sale just because they can’t manage their inventory. How stoooopid is that?! I know stuff happens, but how do you fail to have a SINGLE smart phone in stock?! For the record, I’m done pretending I’m anything other than a very plugged in, techno-dependent girl. When you have to note in your Gmail status that you can’t receive texts or phone calls via cell… you probably have a plugged in problem. There. They say admitting it is half the battle, but there’s no war here. I am happy to be connected, almost 24/7. But if you don’t know, I hate texting. It has its place, but if you need to say more than “almost there!” or “What’s for dinner?”, email me. That’s why I have a smart phone. That makes Thankful Thursday easy as pie this week. (Follow the link… I am NOT happy that I didn’t think to have a wedding pie tower!) I was born into a time where we still had a milk man and our phone was on a party line. I remember picking it up and hearing Mrs. Chester talking to someone. I do downtime; last night, I even closed my laptop while I was knitting, and many of you know that at home, my cell and I are rarely in the same room. I love this technical age, and I’m thankful for my Blackberry, my Nook, my laptop, GPS, XM Radio, the Wii and any other devices I’ve failed to mention that make it easier and more fun to do what I do. Don’t call or text for a few hours though. The Knight has my phone, and he knows how to use it. Now that I know I have a working phone again, I can sincerely wish you a happy little friday! I just have a whole wad of disconnected stuff to share today. 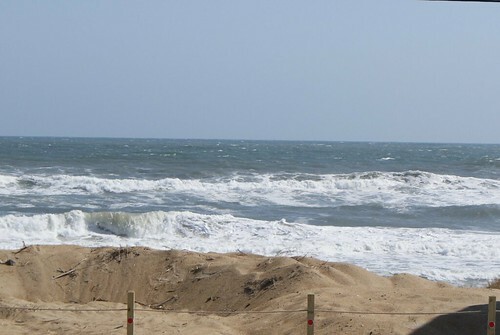 Firstly, I love this cool wave we’re having. Frankly, summer is my least favorite season and in my utopia, it would NEVER be above 80 degrees. It makes me want to knit, if you can imagine! What are you working on? 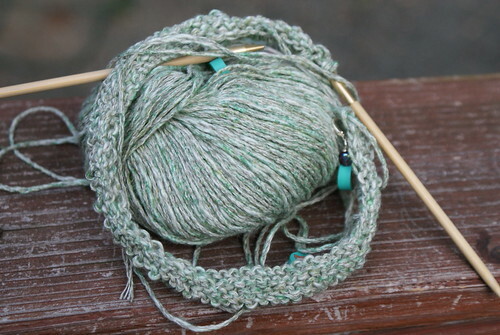 I have three projects I REALLY want to finally finish, but I have this urge to cast on…. THAT. Next, I’ve forgotten to remember several things. A cocktail party Friday night. (Nothing like apologizing your way into being told to come on anyway five days after the RSVP was due.) A bridal shower Sunday. Okay, some of you know I don’t care for “hen parties” but I do adore the bride and both her family and the groom’s family… To RSVP for the same couple’s wedding. Yeah, they know we’re coming because the Knight is in the wedding, but that’s not the point. There’s more, but you get the picture. I finally finished Survivor. I feel like the survivor for finishing it, but again, Chuck made me curious enough about the characters that I had to see it through to the bitter end. I really don’t know how to review this book without pushing a lot of buttons for a lot of people, so I’m going to leave it alone. See Nannie, Nana, Ru-Ru, B’Leigh and all the other women in my life who tried to teach me to be a nice southern lady? I CAN keep my mouth shut when I don’t have anything nice to say about… the subject in the book that I don’t want to have a discussion about. Even though Sis had other ideas (scroll down to the previous post), I didn’t waste a second snatching up Death by Darjeeling. I think Theo (the main character, a woman) and I would be great friends, and I know the fur-girls would love Earl Grey, her “Dalbrador” which is to say, her lab-dalmation rescue dog. If I had the book, I’d look it up… Gotta’ love the internet. Page 12. Whew. I nearly confused myself there. I wanna’ go to that historic, Southern port-town, Charleston, South Carolina. I have been to and through Charleston, West Virginia, which has a most lovely capitol building, visible from the interstate. Go it? My reading onslaught continues. It would seem Sis thinks Maggie Sefton‘s the way to go next. I know I enjoy Laura Childs and her characters, so it will be great to read the first of that series, since I’ve already read the second. You would think this would have been the book Sis went for, eh? 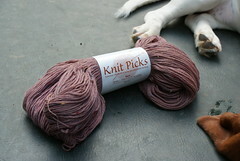 It’s available at Dog House Yarns & More. 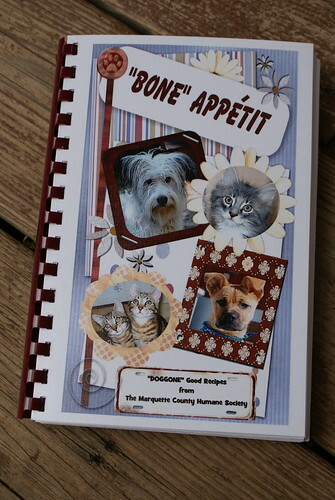 I can’t wait to sit down and really read through it; it has recipes for humans and then in the last section, it has pet treat recipes. … and MORE. 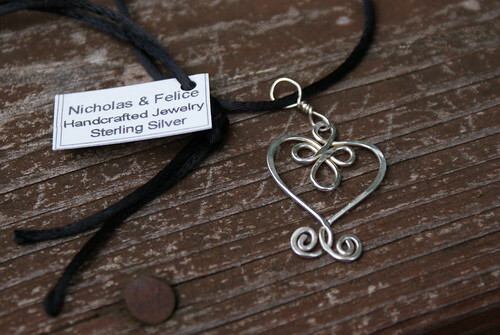 There are at least two cookbooks in the store, a great line of jewelry, roving, etc. 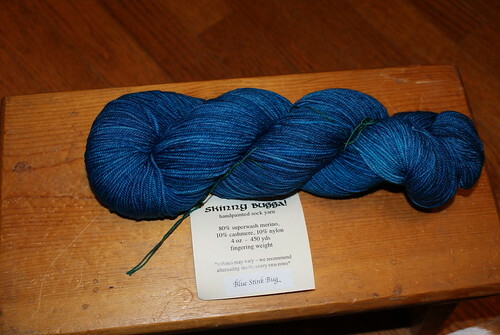 But it is a yarn store, so aside from my gifts and goodies, the YARN did call out to me. I think I touched just about every yarn in there. That’s the problem with being locked in a yarn store when it’s closed. I can’t just sit there… I have to get to know it all! In the end, I couldn’t get past the Hazel Knits colors. I wanted them all, but this Aurora Borealis really spoke to me with its soft green and vivid blue. I’m pretty sure it is destined to be a sweet little shawlette, but who knows!? So, that’s how I spent my Sunday. We also lunched at Lucio’s, and aside from a strange crostini appetizer that was really a salad with four slices of toasted bread and some roasted red peppers on top, the meal was outstanding. I’d definitely get the eggplant parmesan sandwich again, and the tiramisu is some of the best I’ve eaten. Please don’t confuse this spot on Main Street in an old home with Lugi’s, in a strip mall! (I haven’t eaten at Lugi’s, but the names and locations are similar enough…) Thanks Rosanne!!! Warning – might be heart-warming or a tear-jerker, depending on your frame of mind. Today is the anniversary of the last day of Mugsy’s life. I don’t know that I’ll live long enough to stop missing him. 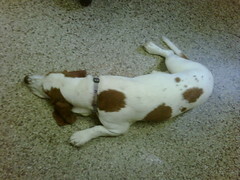 All the dogs in my life have been special, but Mugsy had so much personality and vitality! Not a day goes by that I don’t talk to him. 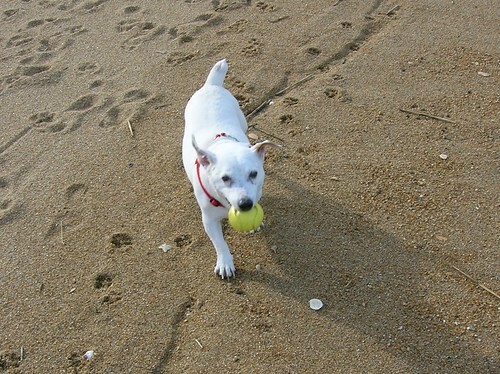 I think of him when I see Wishbone, his female Jack Russell contemporary on our road. 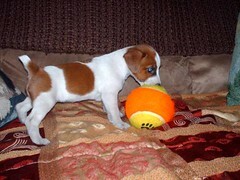 I think of him when I see or talk about Roscoe, a friend’s JRT also about the same age. I see him in Gretchen’s desire to play fetch and her funny little attempts to “guard” me. I love that he leaves us little calling cards, so we know he’s still around, keeping an eye on all of us. Some of you are very familiar with the fact that I don’t believe in coincidences, so finding this ball under the beach house the first time we went down without him was bittersweet. 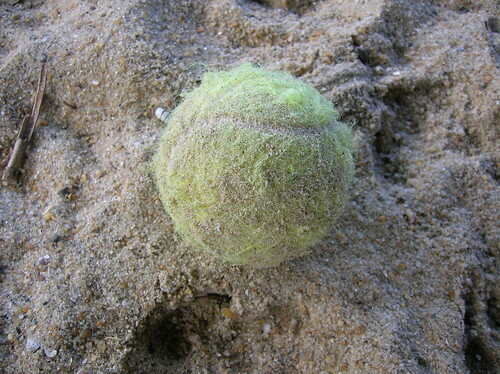 I left it there, because even a ghost dog needs his ball, especially at the beach. This isn’t meant to be a sad post. I’m blessed to have had this darling creature in my life. 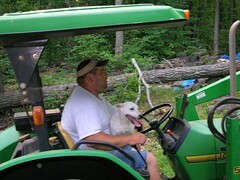 Oh, how it hurts to say good-bye, but I can’t imagine life without a dear pet or ten. They give far, FAR more than we can possibly return. How was your weekend? My only excitement was yesterday’s trip, but I’ll fill you in on that when I have time for some photos!